Phil Mickelson’s 60 on Thursday was the most under par he has been in any of the 2,077 rounds he has played on the PGA Tour. Mickelson began his 27th full season as a pro Thursday by flirting with one of the few feats he hasn’t accomplished — golf’s magic number. The 48-year-old lefthander still shot a 12-under-par 60 in the Desert Classic, tying his career-low score he last shot in the Phoenix Open six years ago. It was the most under par he has been in any of the 2,077 rounds he has played on the PGA Tour. ‘‘That was an interesting shot because I could have easily lost one and I ended up picking one up,’’ he said. 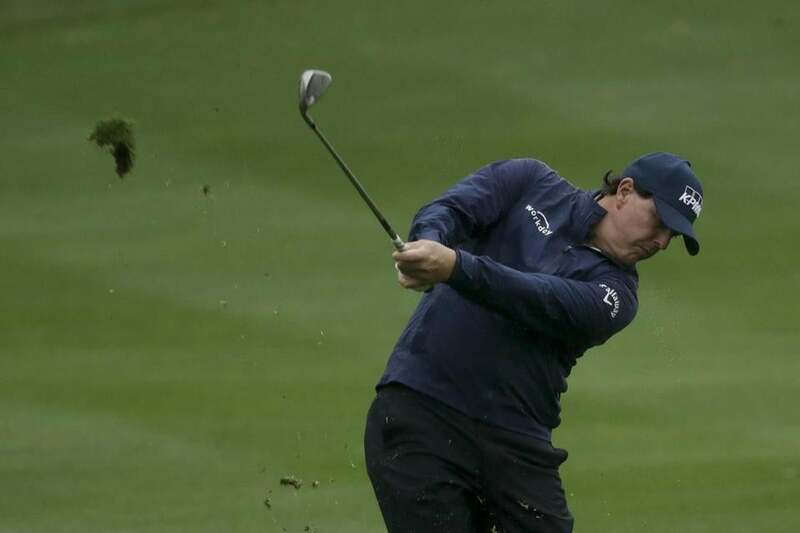 The tournament winner in 2002 and 2004, Mickelson will play the Nicklaus Course on Friday and PGA West’s adjacent Stadium Course — also the site of the final round — on Saturday. He won the World Golf Championships-Mexico Championship last year for his 43rd PGA Tour title and first since the 2013 British Open. LPGA — No one was entirely sure what to expect from the first LPGA Tour event of the year — least of all Stacy Lewis. Nearly three months after Lewis became a mother, and six months after she last played on tour, she opened with seven birdies for a 5-under 66 that left her one shot behind Brooke Henderson and Eun-Hee Ji at the Diamond Resorts Tournament of Champions at Lake Buena Vista, Fla.
Henderson overcame a slow start with a bogey on the second hole and a par save on No. 3 at the Tranquilo Golf Club at Four Seasons. She birdied five of her last eight holes for a 65 to tie Ji. , who had a bogey-free round. The event had the feel of a pro-am because of all the celebrities and athletes, although it wasn’t all hits and giggles. Along with the 26-player field from the LPGA Tour competing for a $1.2 million purse, 49 entertainers are competing for a $500,000 prize fund using the modified Stableford scoring system. European — Shane Lowry recovered from two early bogeys by hitting enough good shots for a 2-under 70, giving him a one-shot lead going into the weekend at the Abu Dhabi Championship. Three-time major champion Brooks Koepka, who has a chance to return to No. 1 in the world this week, bogeyed the 18th hole for a 70 and was five shots behind. Dustin Johnson had a 71 and was eight shots behind. Another shot back was Tommy Fleetwood, who is going for a third straight title in Abu Dhabi.